The Kirby Company began over one hundred years ago with the invention of a vacuum cleaner with an external bag for collecting and filtering dust and air by Jim Kirby. Today the innovation of Jim Kirby lives on with the Sentria carpet care system. This system has twelve different units so that you can vacuum carpets, hardwood floors, clean upholstery, shampoo carpets, and much more with one machine. The carpet shampoo attachment is a unit that you install in place of the vacuum head. After you remove the vacuum head and the bag assembly you can install the carpet shampoo head and complete with a carpet shampoo tank and collection tray. You need to use special carpet shampoo products with this unique system so you must buy your dry foam carpet shampoo from Kirby. The Sentria machine dispenses the foam onto the carpet and you let it sit until it dries. Then you use the Kirby Sentria carpet shampooer system to vacuum up the dried foam and dirt. If you are interested in this Kirby carpet shampoo machine then you have a few different Kirby carpet shampoos to choose from. For people with allergies, carpets can be troublesome because it is very easy for common allergens to hide in carpets. You need to clean your carpets often and with special kinds of carpet shampoos in order to minimize your exposure to allergens. 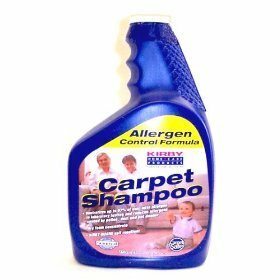 Kirby Allergen Control Carpet Shampoo is just such a product. It has the ability to neutralize dust mite particles which are the most common cause of house dust allergies. It also can reduce the presence of pollen and dander allergens. The dry foam formula is advantageous because that means you do not have to introduce large amounts of water to the carpet. This is of particular concern to homeowners concerned with allergies because excess moisture can create an environment where mold and mildew can thrive. Mold allergies are among some of the worst and you should avoid possible contaminations at all costs. In addition to the anti-allergen capabilities of this Kirby carpet shampoo, it also does a great job at cleaning and brightening your carpets. The allergen formula of Kirby carpet shampoo comes in 32 oz. bottle and one gallon bottles. The only other decision that you have to make is whether or not you want the product to be scented. You have the option of buying unscented Kirby carpet shampoo or lavender scented Kirby carpet shampoo. Kirby Carpet Shampoo For Pet Owners – 32 Oz. 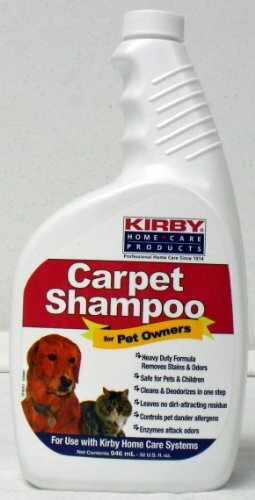 Your other Kirby shampoo product is the carpet shampoo for pet owners. This Kirby carpet shampoo product is a combination of the Kirby allergen control shampoo and a pet stain and odor cleaner that they make for pretreating stains. You get all the same brightening and allergen reducing benefits plus an enzyme that digests pet dander, body oils, urine stains, and other unpleasant pet odors. Some pet formula carpet shampoos only address dog odors, but Kirby’s pet formula carpet shampoo also addresses the odors left behind by felines. The dry foam shampoo formula is also advantageous if you have pets because there is no residue left behind on the carpet or in the padding underneath the carpet that can agitate or upset your pet. Some pets will be more likely to soil your clean carpets again if there are unfamiliar smells present. 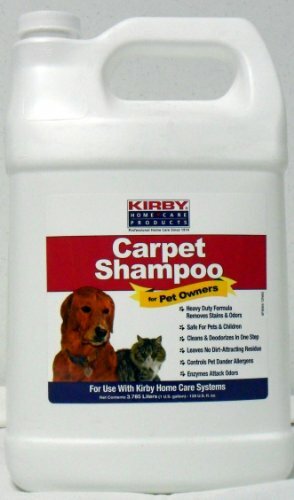 The Kirby Carpet Shampoo for Pet Owners comes in a one gallon size or a 32 oz. size. This item is made by Kirby Home Care Products. It is desigend to be used with any carpet shampoo system including all Hoover, Bissell, Eureka, Kirby, Koblenz, and Rug Doctor cleaning units. One 8 oz. bottle is included. One bottle is enough for 4 tanks. Can be used on all carpets and rugs. Excellent for Berber. Can be used to whiten the fringe of Oriental rugs. Simply pour two ounces into the tank with the shampoo cleaning solution and shampoo as usual. The results are amazing! Lightens and brightens. Restores color to like-new condition. Ideal for light-colored carpeting and delicate Berbers. For use with Kirby Carpet Shampoo System. Genuine Kirby product. Kirby makes some carpet shampoo additives as well including their new Brightening Oxygen Additive. This Kirby shampoo product uses the power of oxygen bleach to give your carpets a fresh look. The Kirby carpet shampoo additive makes your carpets brighter and lighter. The color of your carpet will look like new again. This shampoo additive is added to the tank with the shampoo and water. Kirby Brightening Oxygen Additive works best on light colored carpets and Berber carpets. 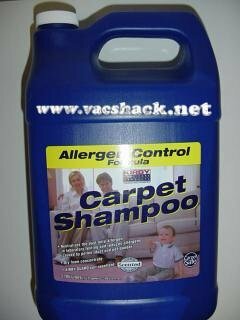 You can purchase this carpet shampoo booster in 12 oz. or 32 oz sizes.